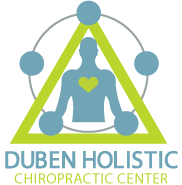 We value our patients' experience at Duben Holistic Chiropractic Center. If you are currently a chiropractic patient, please feel free to complete the following Client Experience Questionnaire. The Questionnaire is in Adobe Acrobat format, and requires the free Acrobat Reader to view. "“I am continuing to work with the emotions that you brought up in me, and last night I had am Ah-ha moment, in which I truly understood the underlying emotion, which now allows me to work on changing my behavior when this deep emotion comes up. You are a big part of the beginning of this awareness and I am so grateful for the help you gave me. Thank you from the bottom of my heart!”"
I keep meaning to thank you when we are there for her appt. and I forget. So, I thought I would send you an e-mail while I was thinking about it. Thank you so much for doing what you do to help people to live a better life. I feel so blessed and grateful that we found you (thanks to Mary) and for what you have done and continue to do”." "“I would recommend Dr. Duben to my friends and family and have done just that! I have been coming to see Dr. Duben for about 4 years. I initially came because i popped a rib out of my chest and have been a believer ever since! His work with NET and natural holistic vitamins are only a plus! His staff is great and friendly! I always look forward to my appointments!”"
If you would like to leave your own please visit our Google + or Yelp pages. We can't wait to hear from you.